During the Civil War, and even in later wars, such as World War II, one way of displaying American patriotism was through the use of patriotic covers, which were envelopes with a patriotic scene on the front of it. 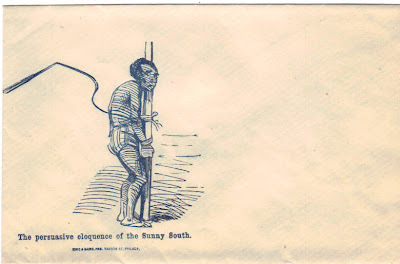 These were envelopes to be used to deliver the mail, as well as a patriotic message. (In current times, one similar collectible item is a "first day" cover, an envelope issued to commemorate a historic place or event, with a stamp and a cancellation mark from the post office on it, though these are issued to be collectible, not to be used as the patriotic covers were). Not only did these covers display pro-American messages, but they also could show support for the United States by insulting or belittling the opposing side, such as the Confederacy or the South in general. 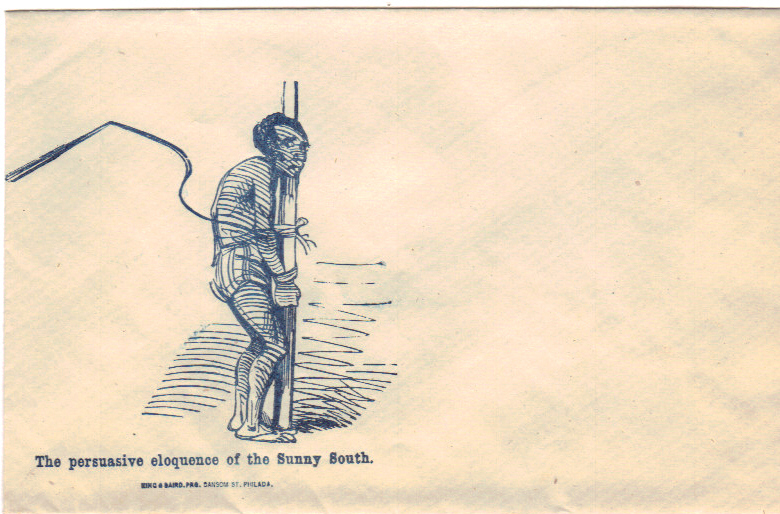 In the one displayed below, entitled "The persuasive eloquence of the Sunny South," an African American is shown tied to a pole, with a whip coming down on his back, serving as an expression of not only anti-slavery sentiments, but also as a commentary about the Confederacy and the printer's perspective of Southern culture and life. They were simply another form of war propaganda, and not intended to claim any sort of objectivity, since their intended audience was not looking for "fair and balanced" portrayals. King & Baird, of Cansom Street in Philadelphia,were the printers of this particular cover.I have not been able to determine a date when this one was created, but it could have been at any point during the war. Also, I did find this blog entry that has more interesting examples and discussion of patriotic covers from the Civil War era. Interesting! You might be interested in this. If you will, follow the link.